I'm Kaleri, and I have been steadily playing World of Warcraft since mid-2007, though I was introduced to the game a little earlier than that in March 2006. I created a night elf priest (Selwin) with a past boyfriend's account on the server Dark Iron to try it out. I was hooked, and ended up buying the game for myself. After a while, that boyfriend and I broke up and I stopped playing the game. My brother found my Burning Crusade game box and re-installed it on our new computer. I showed him and my parents my priest and it didn't take long for them to start playing WoW too! My dad started his characters on the account Selwin was on, so eventually we had to set up an account for me to start playing.. I created a priest on the Bronzebeard server with my parents' guild and that's where my story starts! Kaleri hasn't been in too many guilds, I like to find places where I feel like I could stay a while. After my first guild, I moved to a much higher end guild and stayed with them for most of my WoW career. Eventually, said guild fell apart and I moved to my new home in Windrunner and then moved to Eldre'Thalas where I am now. In Mists of Pandaria I will no longer be playing my priest as my main. I will be playing a guardian druid instead. In real life, I am a graduate with a Bachelor's degree in Geography and Environmental Management. Hi, I'm Sara and I recently started contributing here at Power Word: What? Kal and I met in March of 2011 when I joined her guild Apotheosis. We soon realized that we are pretty much the same person! Same toons, same sense of humour, and we both have a chronic disease (Kal's got Crohn's, I've got Multiple Sclerosis) - so we share a lot of stories, crack jokes about MRIs and steroids, and play priests. Since she's swapping to her bear for MoP, we thought it might work to combine our efforts here to keep the priest end up. 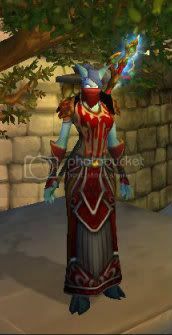 I have been playing since the ZA patch in BC - my first character was a rogue, who I played and raided on through Ulduar. I was in an extremely casual guild then. I was asked to swap to my priest for Ulduar and TOC, and learned about healing from our other priest, Chasten. I decided I wanted something a little more serious for ICC so I swapped to disc (duh), dabbled in making my own guild <Sausage Vendor> and ended up applying to and raiding in <Gravity> on Doomhammer, and awesome guild full of ex-top 50 US raiders who taught me everything I know. I grew to really love my priest, and started getting more serious about it - reading more, learning more, and raiding more. In game I'm a big achievement nerd, and a reasonably serious completionist. Outside of WoW, I'm pretty big on school - B.A. (Hon.) and a Master's in Philosophy with a focus on Bioethics and Metaethics, and an LLB from the University of New Brunswick Faculty of Law, with a focus on going to the Pub. Currently working on doing some freelance editing . Interests include lifting heavy things off the ground and general internet snark.